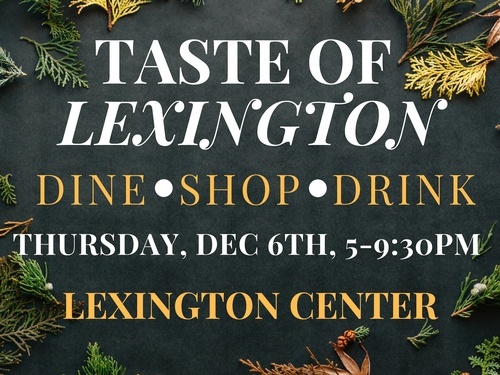 JOIN US for this incredible night out and experience the TASTE OF LEXINGTON 2018. The Lexington Mavens have partnered with the Lexington Retail Association and the Lexington Chamber of Commerce to encourage our town to SHOP & DINE LOCAL! We want to get the Lexington residents to see what is being offered and how the consumer experience is worth more than the convenience of clicking. Replace click & shop with an incredible in store or dining experience and support our town by keeping it alive! Shoppers Card filled out at the businesses you visit and use your Shoppers Card to enter into raffles for goods donated by your local businesses. There will also be a marketplace at the Depot and TD Bank.